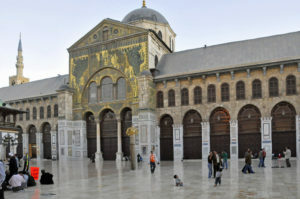 The Great Mosque of Damascus is considered by some Muslims to be the fourth most important mosque on earth, following mosques in Mecca, Medina and Jerusalem. Surprising to many Christians, the Great Mosque, one of the largest in the world, honors both John the Baptist and Jesus. The Great Mosque lies in the center of Damascus on a site devoted to religious buildings since at least 1000 B.C., when it was the location of the temple of a Canaanite weather god. When the Romans captured Damascus in 64 B.C., they converted the temple to one honoring Jupiter. When Paul was baptized in Damascus in about 40 A.D., the temple honored a number of Roman gods and rivaled in splendor the Jewish Temple in Jerusalem. In the late fourth century, when Christianity became the official religion of the Roman Empire, the temple was converted to a cathedral. By the sixth century, the cathedral claimed to hold the severed head of John the Baptist. When the Umayyads established an extensive Islamic caliphate in the late seventh century, they made Damascus their capital. They demolished the cathedral and constructed a mosque on the site. During construction, workers discovered a box they believed contained the head of John the Baptist, who is important to Muslims, and created a domed shrine for the head in the women’s prayer hall. The tallest of the Great Mosque’s three minarets is named for Jesus, whom Muslims revere as a prophet second in importance only to Muhammad. Many Muslim residents of Damascus believe that Jesus will return to their city at the end of time, where he will battle and defeat the Antichrist. In 2001, Pope John Paul II toured the Great Mosque because of its ties to Jesus and John the Baptist, becoming the first Pope to visit a mosque.